Stunning stretch of rugged World Heritage coastline, south of Naples, which commands constantly breathtaking views of both Mediterranean and mountains. Wonderful selection of well-made foot and mule paths connects ancient settlements in an area not accessible by road until the 19th Century. The 'crown jewel' is probably the Sentiero degli Dei. This is an area of antiquity, culture, architecture, religious art, inventive farming and ferocious natural beauty. 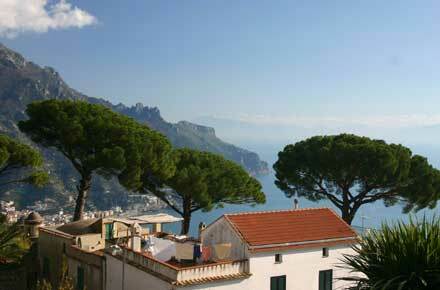 It is also a tourist hot-spot with prices that are often as breathtaking as the landscape. Be prepared to hear your credit card squeal. 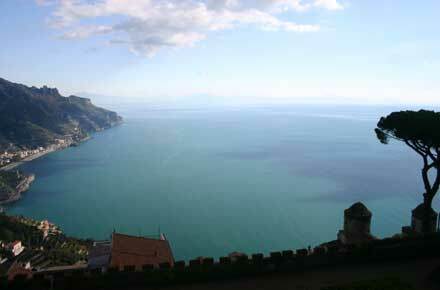 The Amalfi Coast has long been inhabited, but only became accessible by road when the famous Nastro Azzuro was begun in 1815. 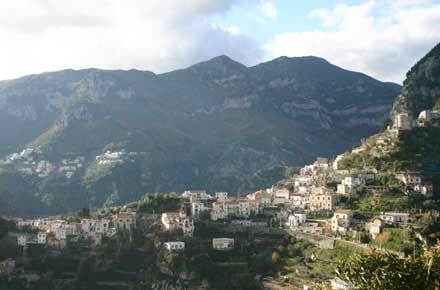 Until then, even the wealthy city of Amalfi was only reachable by sea, and the towns, farms and villages strung along this shockingly beautiful coastline's limestone cliffs were joined by a series of interminable rock-hewn staircases leading to mule tracks across the upper reaches of the mountains. Fortunately, the efficient local SITA bus service has removed the necessity to top and tail most walks with a steep slog up and down. The tracks form a wonderful network of high, rural, day and half-day walks collectively known as the Sentieri Degli Dei (also the official name of an individual, celebrated path) whose views over farms, vineyards, rock-hugging towns and cities and the vast, ever-changing Mediterranean are hard to beat. As rewarding as the natural features of this outstanding landscape is one's simple astonishment at human ingenuity and perseverance, not only in carving out these paths, often from bare cliff-faces, but in creating the farmhouses, hermitages and terraces that cling like eagles' nests to the dizzy heights. 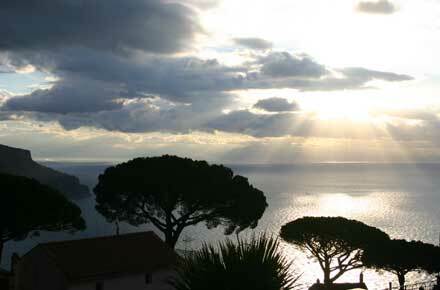 A plethora of writers, poets, artists and musicians have visited and been inspired by this rugged, beautiful coastline: among them the poet Longfellow who, though more commonly associated with America, was a huge Italophile with a special feel for this area, writing fulsomely about the local landscape in his idyll, Amalfi. 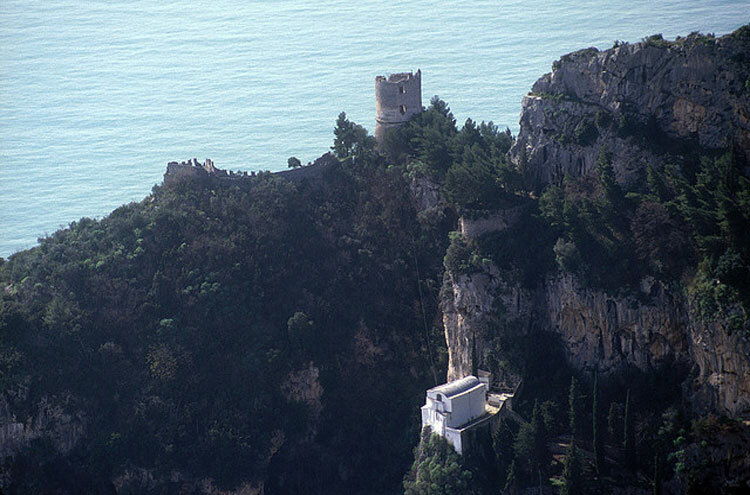 The famous Sentiero degli Dei. Around Ravello and a circuit into the hill around it. 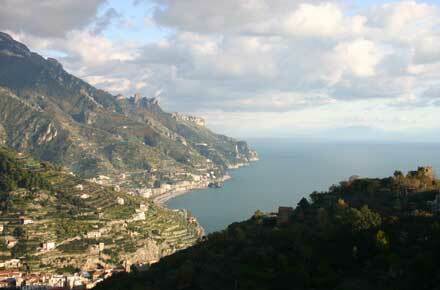 The Pastena/Lone circuit near Amalfi, with fine views over the surrounding area. We would love to hear of any outstanding walks we have missed let us know. Excellent local bus services now make it possible to experience the high paths without the knee-strain of huge flights of stone stairs connecting them to the sea. NOTE: while well-maintained, some paths are both narrow and little more than ledges carved into cliffs. Anyone of a nervous disposition would be well-advised to go as far as they feel comfortable with, and no further.